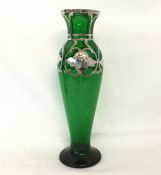 Antique silver overlay on green glass, American, circa 1900-1910. Vase, 10 1/2" high, 3 1/8" wide at base, $1295. Vase, 13 1/2" high, 5 1/4" diameter at widest, $2995. Vase, 8 1/4" high, 2 1/2" at widest, $995. Perfume bottle, 4 3/4" high, 3 1/4" at widest, engraved "T", $695.